With CES 2011 upon us, we must acknowledge that 2011 could well be the “Year of the Tablet”. Everyone—Motorola, Dell, HP, HTC, Acer, you name it—is releasing a tablet or three. If you’re ASUS, you’re announcing four different tablets today. If you are ASUS, I’d like to offer my congratulations and best wishes for this full-on assault of the tablet market. Chances are though, you’re not ASUS, so here’s the rundown on the four new devices. Three of them are Honeycomb-based tablets, joined by a traditional Windows slate. Looking at the Android tablets, we have the MeMO, a 7” Snapdragon slate, the Transformer, a 10” Tegra 2 slate with an optional keyboard docking station (hence the name), and the Slider, an interesting 10” model with a sliding, tilting keyboard (think a supersized HTC Touch Pro 2). All three of these come under Eee Pad branding, while the Windows tablet is branded as the Eee Slate EP121. It’s a 12.1” slate with an active Wacom digitizer and Core i5 UM power. There are IPS displays and 178 degree viewing angles to go around, as well as 1080p playback and HDMI outputs. Like I mentioned before, ASUS is just one company in a huge wave of forthcoming tablets. After Apple, Google is the biggest player in the room, both in the form of existing Froyo devices like the Galaxy Tab and new systems based on Honeycomb. Microsoft, who really made the first tablet push back in 2003, are still there, but seeing themselves being reduced to a bit player until something drastic changes (is anyone else seeing the parallels with Windows Mobile here?) BlackBerry and HP/Palm are hoping to make a splash with the PlayBook and WebOS, respectively. 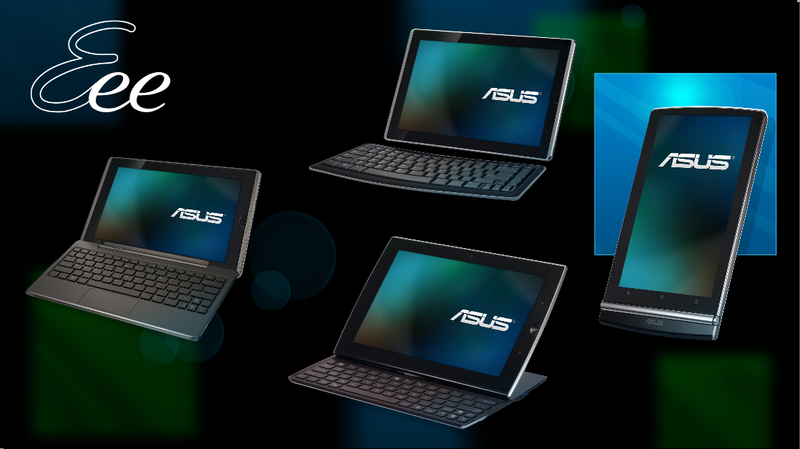 Given all these different players, let’s break down the four new ASUS tablets further.